Light Bright to very bright. 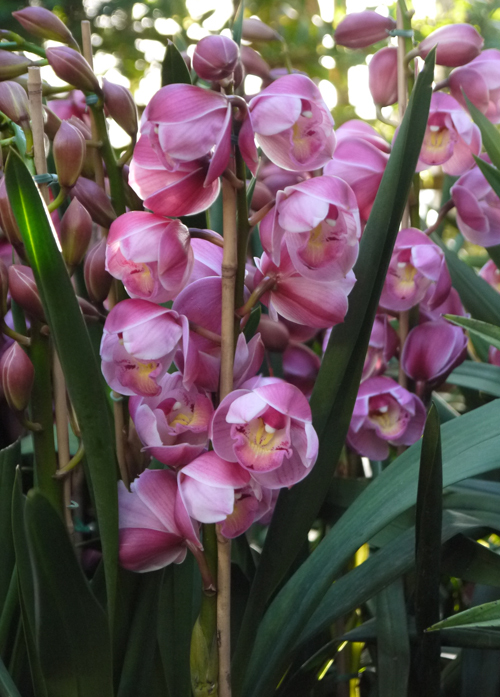 Temperature Cymbidiums grow best in cool temperatures--night temperatures between 50 and 55º. Fertilizer 1/2 strength every 2 weeks during spring and summer. Rest Period No pronounced dormancy. Growing Medium An easy semi-terrestrial mix can be created by adding peatmoss to the classic orchid mix of fir bark+charcoal+perlite. How to Rebloom Growers in the deep South may succeed in reblooming their Cymbidium by leaving it outdoors in autumn until the temperature approaches 40º.